Four recorded journeys running parallel and synchronised. Each video shows the same journey recorded through the windows of a moving car, but from different points of view and at different times. The journeys move between the two main Gate entrances and exits to the Phoenix Park, in the heart of Dublin. Each separate journey is meticulously recorded in real time to take exactly the same length of time as each other. The result is a single filmic pasage, contained within four separate journeys, which appear at first to represent the same. The music is by the string quartet Apolcalyptica playing Metallica. The journey traces a colonial history of Dublin and passes numerous landmarks and scenes of Irish political history including the Áras an Uachtaráin (the Presidential residence), Wellington Monument, the Magazine Fort on St Thomas’ Hill (captured during the Easter Rising of1916), Dublin Zoo, the Papal Cross, the Dog Pond (bombed in 1941), the Deer Park, and the scene of the Pheonix Park murders, the assassination on May 6, 1882, of Lord Frederick Cavendish, British secretary for Ireland, and Thomas Henry Burke, his undersecretary, in Phoenix Park, Dublin. They were stabbed to death by members of the “Invincibles,” a terrorist splinter group of the Fenian Movement. 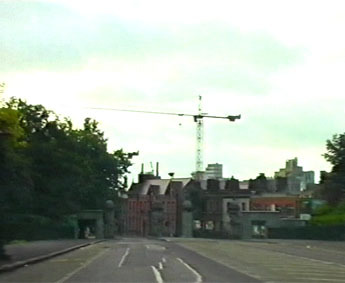 The film also shows the background of the extensive building of new Dublin in the midst of its economic repositioning in the late 1990s. Paul O’Neill is an independent curator, artist, lecturer and writer, currently based in London. He is interested in addressing the systems of interpretation that are involved in making sense of the world around us, as much as he is concerned with the compulsions that lead to interpretation and meaning itself. His practice explores the experience of moving across things, of traversing territory rather than patrolling boundaries. Sometimes this exploration takes the form of curatorial projects, art- making, writing or lectures. He has curated over 40 exhibitions and projects, that include recently: Mingle-Mangled, Cork Caucus, Cork; General Idea: Selected Retrospective, Project Gallery, Dublin; La La Land, Project, Dublin; Coalesce: The Remix, Redux, London; Tonight, Studio Voltaire, London, 2004 Coalesce: With All Due Intent at Model and Niland Art Gallery, Sligo, 2004 and touring to K3 Gallery, Zurich in 2006 and Are We There Yet?, at Glassbox in Paris.